Mazda is a company that loves reinventing their brand. Unlike any other manufacturer, the Hiroshima based company reinvented itself no less than twice between 2002 and 2015. After an ambitious marketing move to revitalize the brand in 2002, Mazda initiated a radical new exterior design strategy while switching model names from triple digits like ‘626’ to single digits like Mazda6. Then, just a decade later in 2012, it launched the brand’s signature SkyActiv suite of technologies that donned for the first time the brand’s all-new Kodo design language, first featured in the CX-5. Now, in 2019, Mazda has just unveiled its third rebirth in just 17 years with the all-new Mazda3. This model is totally new from the ground up. The hatch and sedan combination mark a gorgeous new design direction for the company, a fresh aesthetic look that will permeate down throughout the entire Mazda range as new models come onto the market. And after only a few minutes in the car, I realized that this new Mazda had just replaced the VW Golf as the compact segment’s new benchmark and could easily challenge more luxurious models like the Audi A3 and Mercedes CLA. First things first. The Mazda3 redesign started with a focus on the pelvis. Yes, Mazda pinpointed study of your pelvic region as a way to improve comfort, handling and ride quality. It all began when ex-soccer player turned Mazda handling chief, Yasuyoshi Mushitani, had a light bulb moment while recuperating in hospital from knee surgery in 2010. Stuck in bed for two months after twisting his leg during a game, the man who oversees the final suspension settings of Mazda’s entire range had plenty of time to talk with doctors about leg anatomy and the finer points of walking. “I realized that what they were saying about my knee and the mechanisms of walking were exactly the same as fine-tuning the chassis and suspension settings on a car. It’s all about balance and what’s at the source of that balance.” Yes, you guessed it, the pelvis. “I learned in hospital that the secret to better ride, handling and balance lay in the study of human walking techniques and that maintaining an upright pelvis was essential for not only good posture but ideal seat design,” he stresses. When negotiating an S-bend for example, Mushitani says the torso and head move in different directions, a critical factor that needed to be minimized. But thanks to our new improved seat frame, more supportive cushions and most importantly, a new lower seat design and lumbar that promotes an upright pelvis position, we have created a seat that restricts head movement but also keeps the whole body more stable during normal driving.” Comparing results to rivals like the VW Golf and Subaru Impreza, the Mazda3’s new seat does deliver greater stability, better ride and less pronounced head movement. Another part of the puzzle to create a better handling, more comfortable Mazda lay in chassis design. 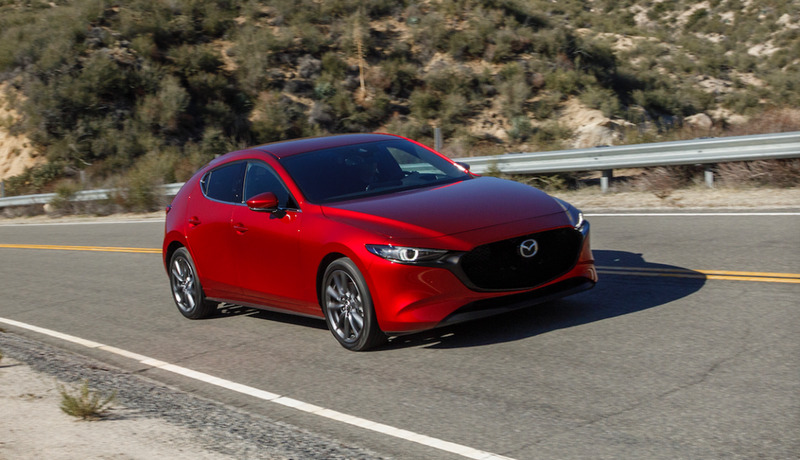 The new platform is both stiffer and lighter than before, and it uses technologies both old and new designed to help the Mazda ride and handle better than before. That also results in crisper steering. There’s a lot more weight in the Mazda3’s wheel this time around, with loads of feedback as you turn. The outgoing Mazda3 was a class-leader in terms of design. The new model takes that design language and completely redefines it. As Mazda’s head of design, Ikuo Maeda, told me late last year, “We decided not to get on the EV and self-driving bandwagon like everyone else, but to instead retain and strengthen our unique brand identity through styling.” In a design rethink that does away with strong edges, Maeda and his team transformed the Mazda3’s styling from a double motion to a single motion theme, as with the award-winning Vision Concept that captured the 2018 “Most Beautiful Concept” at the prestigious Festival Automobile International in Paris. So what’s ‘single motion?’ As Maeda explains, “Here we focused on a new treatment of light and shadows, a process in which we generate ever-changing reflections in surfaces.” Cryptic indeed. Well, whatever wizardry Mazda has played with their new design it certainly stands out. 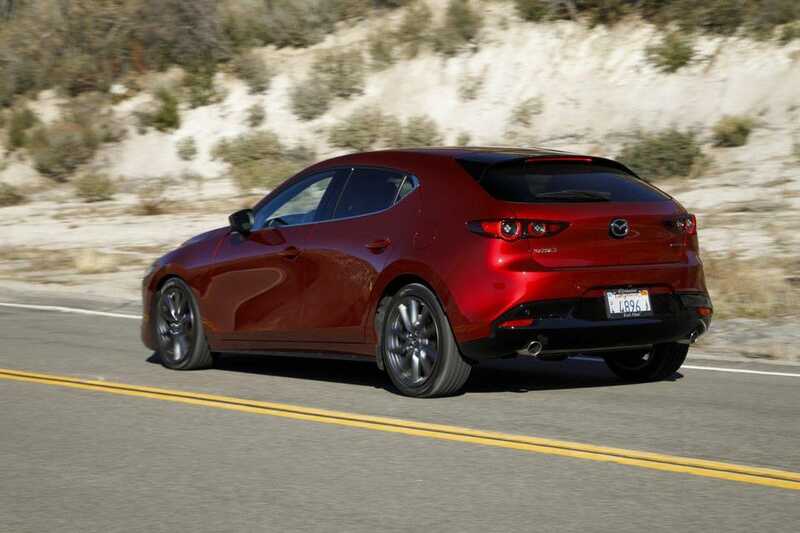 From its signature Mazda grille to the sleek side profile and tight tail, the Mazda3 is perfectly proportioned. Although I must say that while the sedan’s proportions generated universal positive reaction from the gathered media at the launch in Los Angeles last month, the hatchback was a little more polarising with some commentators questioning the expansive C-pillar. I like it and think it compliments the sedan. The big news is the employment of Mazda’s i-active AWD system. Although it was not available on our test car, this is such a critical ingredient of the new model, that I could not ignore it. Feeling disappointed at not being able to drive the full-spec AWD model and not wanting to miss out on a chance to relay one of the car’s highlights to our readers, I asked an engineer for a quick comment on the new AWD. I am told that the system powers the front wheels under normal driving conditions and can send up to 50% of the power rearward pro-actively. “As a system, it is now impressively sorted, and delivers excellent grip and turn-in as it works in conjunction with our G-vectoring Control Plus. It reduces engine torque heading into a corner, loading up the front tires and bringing a quicker sharper turn-in response. At the exit of the corner, it applies the outside front brake while sending power to the rears as conditions require to maintain stability and your chosen line through a corner,” he explained. Okay that sounds impressive and a real challenge to Subaru and Audi. I’ll get a chance to test it later this month in Japan. The cabin has been totally redesigned with simple but subtle lines and an air of elegance and luxury mixed with hi-tech gadgetry. Mazda has finally caught up with the rest of the world when it comes to in-car infotainment. It gets an 8.8-inch display that finally supports Apple CarPlay and Android Auto and the optional Bose sound system now has its sub-woofers located not in the front doors but in the side panel just above your feet, delivering a fuller and richer sound experience. We spent all afternoon listening to Bohemian Rhapsody. Brilliant. On this international drive in LA, we were offered the two main global engines for now; the Euro-spec 2.0-liter SkyActiv-G mild hybrid gasoline unit developing 122hp and 150 lb-ft of torque, and the U.S.-spec 2.5-liter SkyActiv-G pumping out 187hp and 186 lb-ft of torque. Both will be offered with a choice of either the 6-speed manual or 6-speed automatic transmission. American buyers will be happy to hear that the 2.5-liter generates sufficient punch, but without a turbo and the need to deliver better fuel economy, low-end grunt is not as strong as it could be. But by managing the revs, drivers can get around this issue. Inspired by the 6-speed manual in the MX-5, the Mazda3’s manual is plucky, shifts with precision and boasts a solid mechanical feel. The auto also changes gears with almost no shift shock and is well mated to the SkyActiv engines. The new SkyActiv-X powerplant will join the range in Europe later this year and should, according to Mazda, be offered in the U.S. by 2020. The impressive SkyActiv-X uses both a spark plug and the diesel cycle to generate greater bottom end torque with better fuel economy. Since its predecessor came out in 2015, the Mazda3 has vied for the segment’s top spot with rivals like the VW Golf. But the company’s uncanny focus on the pelvis in its next generation model to deliver an all-round better car has proven a winner. 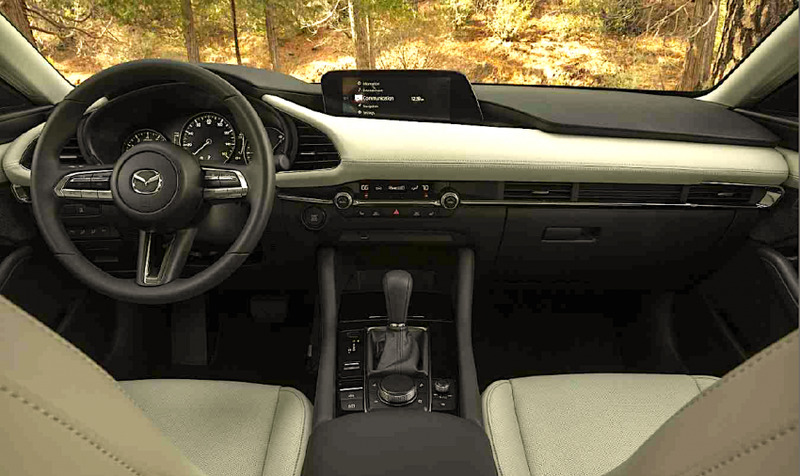 Dare I say that the quality, design and handling of Mazda’s new entry-level luxury experience might actually tempt buyers of the Mercedes CLA and Audi A3 to have second thoughts. Yes, the compact segment now has a new benchmark.